A type of classroom research in which faculty ask specific questions about their students or their teaching, gain information about these questions, and use this information to learn about teaching and their course in particular. Riding, Phil, Fowell, Sue and Levy, Phil (1995) "An action research approach to curriculum development". Information Research, 1(1). nontraditional assessment such as the pyramid exam, portfolios, oral presentations, project papers, and other performance based approaches. Also, see Authentic Assessment. the process of assessing student learning as in tests; the term evaluation is sometimes used in place of assessment, however, as summarized by Douglas Eder - "Assessment is the monitoring of student learning; it is not the evaluation of a professor's teaching." assessment in which students do realistic tasks that are similar to tasks involved in the regular learning processes in the classroom so that instruction and assessment are integrated. Students may be involved in the evaluation process and assessments are varied, including interviews, performances, portfolios, projects, exhibitions, and writing samples. Some believe that the most important thing a teacher needs to know is their students' preconceived ideas about the subject. Clearly students bring many conceptions of how the world works (when incorrect these are called misconceptions or preconceptions). The background knowledge probe is given in the first class and assesses students' prior knowledge (e.g. vocabulary) and preconceptions (e.g. abut evolution). a hierarchical list of higher level thinking skills: knowledge, comprehension, application, analysis, synthesis, and evaluation; different teaching approaches require different cognitive levels (e.g. projects develop skills in analysis, synthesis, and evaluation). See also Cognitive Skills below. a type of inquiry that represents an intermediate between guided inquiry and open-ended inquiry. The key differences are (1) who has "ownership" over which components of the activity — the students or the instructor, and (2) what is the goal of the activity — to demonstrate existing knowledge, to teach the process of knowledge construction, or to generate new knowledge to the discipline. Please see Inquiry below for a more complete explanation. A way to elicit many ideas quickly about a question or topic. Ask students a question and for quick responses. Write these on the board, an overhead projector, etc. without comment. Rule is that nobody can criticize or comment on anyone's ideas. Students are assigned roles representing various stakeholders in a local dispute and given 2-3 minutes to orally present their point of view, as in a town meeting. The cognitive skills you want students to learn and practice will vary based upon the lesson and class. In general, students need to be able to know facts and comprehend information to interpret graphs, tables and other data. Once they have accomplished these goals, they can apply their knowledge to new situations and analyze given situations by identifying and breaking down information to determine the roles or distinctions. Students need to then learn to synthesize pieces of information and concepts by developing new patterns and ideas and finally evaluate by making judgements based upon their knowledge and understanding to judge situations, make comparisons, and defend their ideas. Knowledge, Comprehension, Interpretation: are the basic skills students need in order know facts and understand what the information means. Application and Analysis: are the skills students need to transfer information and categorize it. Synthesis and Evaluation: are the higher skills students need to make connections between seemingly unconnected information and make judgements grounded in sound knowledge. Additional Note: There is a misconception that constructivists believe that teachers cannot give students "the answer"; however, this is often a gross oversimplification of a rich and complex theory that has lead to derision by some faculty of learning theories in general. structured interaction of small groups of students who work together to achieve a common goal which includes helping themselves and other students learn best; involves both interdependence (all members of the group participate to complete a task) and individual and group accountability (each member is accountable for the final product). students draw a conceptual map (a graphic representation such as a web map) that shows relationships between aspects of a concept or principle. Concept maps can be used to assess students' understanding of relationships, ideas, or concepts. process by which the success of teaching approaches, projects, or programs is determined. The term "assessment" is sometimes used in the place of evaluation; however, as summarized by Douglas Eder — "Assessment is the monitoring of student learning; it is not the evaluation of professors' teaching." A critical aspect of student-active teaching is the evaluation of your efforts. Evaluation is a hallmark of contemporary teaching reform for several reasons. First, evaluation provides you important feedback about changes you have made; this allows you to make improvements and have confidence that your teaching goals are being met. Evaluation is important for students as well. You will involve them in the process of change by asking for their input and discussing why you are making changes to your teaching. Formative evaluation also helps students become more reflective about their own learning and it lets them know if they are "getting it" before the final test or final draft. The first step in evaluation is clearly identifying and writing down your goals for the students. What is it you want them to know and be able to do? This list should be fairly short and as specific as you can make it; the more time you put towards this, the more successful you will be with your evaluation. This is akin to asking clear research questions and then designing experiments that get at these specific questions. Next, choose a type of evaluation that fits the goals. There are numerous approaches to course evaluation. Here are examples of several that could be used with Experiments or Issues. Goal: Students work effectively in groups. Overview: Effective groupwork depends on teamwork skills. These include taking responsibility, working cooperatively with others, listening, and carrying your share of the load, Students can be capable evaluators of themselves and their colleagues if you help them learn how to do this. Peer evaluation involves development of a scoring rubric. You can make your own rubric (with student input) or modify an existing one. Goal: Students write scientific-style research papers. Overview: A rubric for writing a research paper for an experiment requires you to outline in detail the components of the paper, what you are looking for, and how "good" is different from "average" and "poor". It is also helpful for students to see examples from past classes of excellent papers. Goal: Students learn how to design experiments. Overview: A common goal for inquiry-based investigations is that students become more skilled at designing experiments and critiquing experimental design. Evaluation of this facility might involve having students assess the design of a published experiment. They could also critique each other's designs early in the conception of an experiment. For this evaluation you would again need to develop a rubric that outlines the qualities of good experimental design. This is a sophisticated goal that requires a good amount of class discussion. Goal: Students understand and appreciate the process of science. Evaluation: anonymous written comments after informal discussion. Overview: in this multiweek experiment it might be useful to pause midway and simply talk to your students about "how it is going". This could involve a directed discussion followed by students writing anonymous comments on index cards. To keep the discussion focused, start by outlining your goals for the investigation. For example one especially challenging goal is for students "to appreciate that science is a reiterative process and that there is often not a clear answer". With this goal restated in black and white, students who are feeling frustrated about fuzzy results may be more likely to voice their frustration and gain a better understanding that this is simply the nature of doing science. In the class following this discussion, be sure to take a little time to report back on the students' comments in class and on the cards. An extensive discussion on evaluation appears in D'Avanzo, C. 2000. Evaluation of Course Reforms: A primer on what it is and why you should do it. ESA Bulletin 81:206-209.
groupwork is structured so that students assume specific roles (e.g. facilitator, skeptic, recorder, reporter) as in Problem Based Learning. ongoing evaluation of teaching conducted by instructor for diagnostic purposes and that informs curriculum redesign; see evaluation. in small groups students move around the room from station to station at set times and discuss questions or problems; can be used in the first class so that students meet each other and faculty can assess prior knowledge; for example, in an environmental ed course a teacher could post 3-5 questions about definitions of environmental education on separate sheets on paper taped as stations on the wall; groups of students pause at each station, discuss the question, write comments on the sheet, and go to the next question when a signal is given. a way for students to comment on the effectiveness of fellow students in groups. Clearly this is controversial, and some faculty believe that students should not assess each other. There are many ways to do this and you should modify the examples provided. For instance, comments can be only given to students (you do not see them) or the assessment can be read and commented on by you. It is very important to carefully explain the purpose of the assessment and how you will use it. teachers guide students through projects by giving them starting questions, prompting new discussions with ideas and methods, or acting as a supervisor in other ways; can be in the beginning of a course with naive students and followed by open-ended inquiry. In contrast, open-ended inquiry is less structured. These relationships are depicted in an Inquiry Framework. good for helping students develop questions about new material or recognize what they don't know. Students are given open-ended questions (e.g. "explain how", "what if", "how does ____ affect ____?") that they ask each other. This is often used to break up a lecture. A common technique is "turn-to-your-neighbor", also called "think-pair-share" - when students briefly discuss a question or problem with the students around them. Students can work together in this way in any size class, including large ones. In his essay, Lecturing with Informal Cooperative Learning Groups Karl Smith explains how to use informal groups in large lectures. This involves posing a question or problem, asking students to discuss the question with their "neighbors", stopping this, asking for volunteers, and leading a discussion. Dr. Smith typically uses this approach twice in a 50 minute lecture. The specific problem or question is of course very important. Questions can be used at the end of a lecture segment to solidify an idea or see if students "got it". They can also be used to stimulate interest in the next lecture topic. The timing of the groupwork depends on the difficulty of the problem. The problem or question should be challenging enough that students need to discuss it with their colleagues, but not too hard or it will frustrate them. As with any groupwork, discuss its purpose with the class. Explain why you are putting them in groups and how they should interact. Often it is helpful if students develop their own group rules (e.g. everyone should participate, no one should dominate). If your students work in groups throughout the semester, spend a few minutes midterm to discuss how well this approach is working for them. If problems arise, deal with them quickly. process by which scientists pose questions about the natural world and seek answers and deep understanding rather than knowing by authority (from the National Science Education Standards). 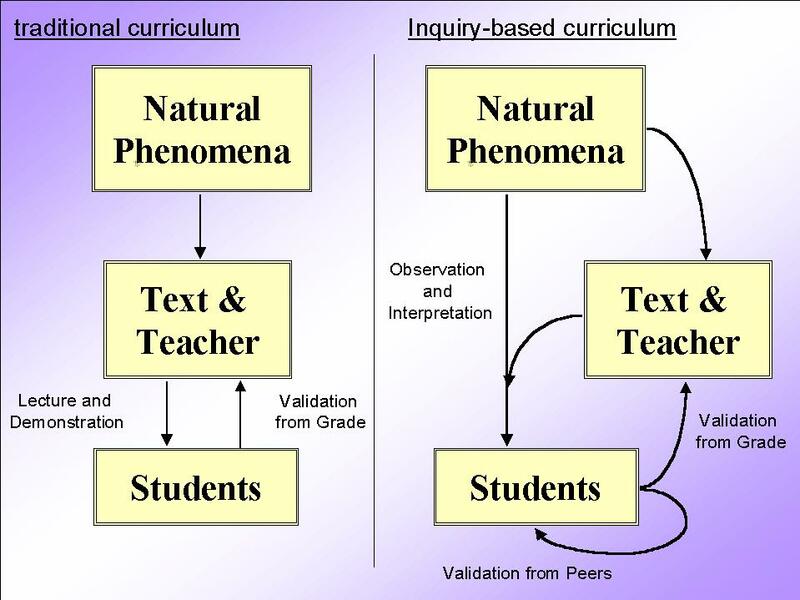 The critical difference between inquiry-based curriculum and more 'traditional' curriculum lies in the relationship between the "natural phenomena to explain", the "teacher/ texts", and the students. These relationships are compared in the following figure. There are many types of inquiry approaches to teaching. For example, Guided Inquiry, Bounded Inquiry, and Open Ended Inquiry. The key differences are (1) who has "ownership" over which components of the activity — the students or the instructor, and (2) what is the goal of the activity — to demonstrate existing knowledge, to teach the process of knowledge construction, or to generate new knowledge to the discipline. These relationships are depicted in an Inquiry Framework. Web Inquiry Projects: Using web resources to promote classroom inquiry (includes a table showing four levels of inquiry: edweb.sdsu.edu/wip/four_levels.htm), by Philip Molebash and hosted by the Educational Technology Department at San Diego State University. Provides historical background, content standards, elements essential to inquiry-oriented teaching and learning, and describes and debunks several myths that misrepresent inquiry in school science programs. Inquiry and the National Science Education Standards: A guide for teaching and learning. 2000. National Academies Press, Washington DC. Exploratorium Institute for Inquiry, resources for inquiry teaching and learning. Teams of 3-4 students learn different aspects of the same problem or issue and then teach it to their classmates; members of the first group learn the material on their own and next discuss it among themselves (including how to teach it to other students), the class then breaks up into a second groupings of 3-4 with one representative from the first group and each student teaches their own area of expertise; for example a chapter of a book could be divided into 4 parts with students working in jigsaw groups to discuss the whole chapter; the second group should be given a problem that requires the total set of information. The jigsaw is a popular cooperative learning strategy for material that can easily be divided into 3-4 logical sub-components. The idea is that students first work with team members to become "expert" on one aspect of the whole (e.g. part of a text chapter). Then the class is rearranged into a second set of groups so that each second team has someone who is expert on each sub-component (e.g. each part of the chapter). Students in the second group teach one another each segment and then, with all the jigsaw pieces now available, they put them together to solve a puzzle. The success of the jigsaw depends on your students understanding their piece of the whole and their ability to teach this to their colleagues. Before you do the actual jigsaw you will have to work with the class so that they understand the meaning of this responsibility. Depending of the sophistication of the students, you may want to develop rules with them for their conduct in both groups. Good rules include: each person in group 1 is responsible for helping each team member comprehend the information, everyone must make sure that they personally understand what they will be teaching, members of group 1 should work on strategies for teaching their piece including aspects that they found difficult to grasp, "teachers" in group 2 should insure that each team member understands the information they are explaining, and everyone in group 2 should insure that they comprehend what is being taught. The jigsaw is more challenging than other cooperative group approaches because moving students around can be confusing and because it depends on students actually teaching each other with you not present. Its success largely depends on your preparing and "training" the students and also talking with them about why you are using this approach in the first place. As the students work together in their groups they will inevitably turn to you for answers to their questions. Try not to answer their questions directly but instead ask leading questions that will help them figure out the answer for themselves. if you have teaching assistants, you will have to teach them how to do this. The jigsaw often works best if it is done during classtime when you are available to help students and they are all present. If you cannot give this much class time to this problem, an alternative is to have the first group meet outside of class and the second in class. This is not possible in many colleges and groupwork via computer is another alternative. Metacognition is a mental skill which students use to monitor their understanding. Metacognition is 'knowing what we know and what we don't know'. It is very important in student-active teaching because a particular goal of metacognitive teaching is for students to be aware, active, and in control of their own learning. Knowledge about metacognition as applied to teaching can help faculty understand how to put students in charge of their learning and why various approaches accomplish this goal. Students often tenaciously hold onto erroneous, often predictable ideas that interfere with their ability to correctly learn new concepts (also called naïve or alternative conceptions). Contructivism forms the basis for research on misconceptions because constructivists believe that knowledge acquisition requires students to mentally restructure their own learning. Therefore, they expect that a student's understanding is often different from what is taught. Common misconceptions in ecology include students' understandings of photosynthesis (plants don't respire; all elements come from the soil), energy (accumulates in food webs), food webs (only top-down regulation exists), evolution (is directional, "progressive," and historically extinction is rare), and living vs. nonliving things (fresh vegetables in grocery store are "dead"). this is a commonly used technique for ongoing evaluation. Ask student a simple question about some aspect of the class that they can answer in a minute. Collect the answers on 3x5 cards, review them for the feedback, and report to the students repeated comments — or other interesting points — in the next class. See www.iub.edu/~teaching/craig.shtml for use in a large class. A form of classroom assessment to help the instructor identify a lessons most confusing points. Students are asked to write down the most confusing or problematic concept from a given lesson, experiment, reading, or other activity. These can be done anonymously (written on a 3-5 card at the end of class) or not (students send an email to the instructor). The faculty member collects the "muddiest points" from the students and can then address the concept more completely to improve students' understanding. For more ideas regarding the use of this technique in your classrooms, visit the following links. teachers acts as a facilitator for student who — as independently as possible — come up with initial and follow-up questions, design an experiment, analyze the data and so on. These projects could follow guided ones in a course. Students inexperienced with research can do open-ended inquiry given enough time and support. Paired think aloud is an example of groupwork in which one student "presents" and the other records and encourages. It is a good way for shyer or more reticent students in particular to take the time to express their thoughts and questions. As with all of the student-active approaches that are unfamiliar to students, you will need to explain why you are using this particular one. Many recorders will be tempted to help another student who is struggling with some aspect of data interpretation, especially if they believe that they know the "right answer". Discuss with the class why the role of recorder is important and what they should and should not do when they are in that role. You can assign students to their roles in many ways; easy random techniques include birth dates ("youngest in a calendar year is the recorder), last digits of phone numbers, and the like. Class discussion following the paired work can be as usual. Time needed for the individual and paired components depends on the sophistication of your students. a technique in which teams of 4 work in pairs on a problem; one student works on the problem while a second student coaches and then these students switch roles; in the next step the pairs check their work with the pair of students. before a class discussion students work in pairs and together interpret the table or figure plus additional questions; this preparation allows for a better discussion. students act as editors for one another's papers. There are many ways to do this but all help students recognize common writing problems (that they cannot see in their own papers), improve drafts, get drafts done on time, and take writing more seriously. Many teachers require students to be accountable for their reviews. students working together to accomplish a task in which success depends on participation by each person. developed by medical schools in the 1950's and adapted for a variety of teaching situations; students are given a problem or a puzzle "cold" (such as symptoms of an ill patient or information from a polluted site) and work together in formal groups to discuss what is known, develop possible hypotheses about the problem, and work together to find and synthesize information needed to solve it; used with undergraduates in introductory and more advanced courses throughout the country. assessment tool that combines both individual and groupwork; tests for ability of student to synthesize and investigate complicated questions; involves a series of steps in which students work alone and in groups. in formal groups students assume roles such as discussion leader (keeps things going), scribe (records what is said), skeptic (questions), project director (makes sure everyone has a work assignment), task leader (keeps the work on track), and liason (reports to the instructor and plays a leadership role). a member of a team roams around the room seeking ideas and help from other groups. A classroom assessment technique in which students are asked to recall and review information presented in prior lessons. Students asked to write down a few of the main points from a previous lesson (recall) and then bring those separate ideas together into a single summary statement (summarize). Students then generate one yet unanswered question (question) they have from that previous lesson and then provide connection from the concepts in that lesson to the overall goals for the course (connect). Student can also be asked for comments they may have regarding their understanding of the concepts. For more information regarding RSQC2, visit the following websites. written guidelines by which student work in assessed; grading rubrics articulate clearly how student work is judged and give standards needed to achieve each grade; useful for both students (what is expected on them is clearly articulated) and faculty (makes grading easier and less subjective). Student-Active teaching and learning involves students in the learning process. Certain cognitive research (see constructivism) suggests that genuine learning requires more than just passive listening — students must discuss, write, ask and answer questions, or otherwise engage in their own learning. These activities in turn require students to use critical thinking skills such as analysis and evaluation (see Bloom's taxonomy of higher order thinking). Faculty use a variety of approaches in student-active classrooms including cooperative groupwork, debate and discussion, and open-ended problem solving. Formative evaluation — ongoing evaluation of a course — is a critical aspect of student-active teaching because this process helps teachers be more reflective, effective teachers. More information appears in the TEACHING ESSAYS and TEACHING LINKS. students think about a question, pair off and discuss the question with a classmate, and then share their answers the the whole class; can also be called turn-to-your-neighbor. same as think-pair-share except that students share their answers with another pair. This is a very useful technique for any size class. With this approach, faculty give their students a problem to work on (figures or tables to interpret, a written question etc.) and simply ask them to "turn to their neighbors" in the class and discuss the problem. Students should work in small groups of 3-4. The success of this approach depends a great deal on the problem given to the students. It should be challenging enough that they need to discuss it with their colleagues, but not too hard or long to be too frustrating. It should also focus on a core concept or course goal (e.g. helping students apply information from one situation to another). Karl Smith, an engineering professor and education reformer from the University of Michigan, uses this approach in a formalized way in many of his classes. He first gives a quick overview of the focus of the "lecture". Then he lectures for 10 minutes or so to prepare the students for the first turn-to-your-neighbor problem. After the students discuss the problem with their neighbors, he quiets the class with a bell and opens the discussion, calling on students if necessary. After this he lectures again for 10 minutes to cement the idea illustrated by the problem. This is followed by another problem and discussion. He finishes the class with an overview of the main concepts and points. Dr. Smith finds that this combination of cooperative groupwork and targeted, spaced lectures helps students learn the material required for engineers in a way that emphasizes cooperation, learning how to listen and how to explain, problem solving with others, and active engagement. Think-Pair-Share is a modification of turn-to-your-neighbor. With think-pair-share students are asked to first think about the problem on their own before they pair up with another student to discuss it. "Share" indicates the whole class discussion that follows. an in-class modification of the pyramid exam for large classes; student first take the test alone, the test is collected, students then work together in informal groups on a fresh copy of the exam which they turn in as a group or individually; final grade is some percent of both exams. An approach used to enhance a discussion with "low stakes" writing. Students are asked a question and given a few minutes to briefly write answers or comments. What they write is for their use only and not handed in to the teacher. Students need to understand why this is useful for the discussion and can help them write better (otherwise they may not take the exercise seriously).